England captain Alastair Cook has claimed the team is yet to shut their critics' up, who have often lambasted the players for their inability to play spin well, but the skipper believes the team is moving in the right direction. 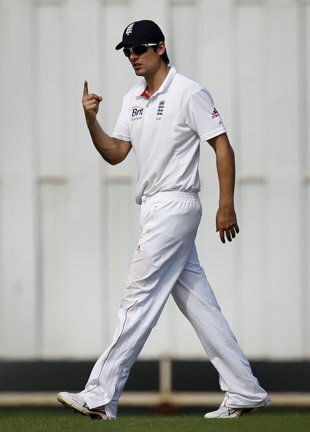 England won the third Test match against India in Kolkata to take an unassailable 2-1 lead in the ongoing series, and Cook wants the player to give their best to win the final Test match in Nagpur, starting Dec 13. "You cannot look too far ahead in this game. Cricket has a way of biting you on the backside," the Daily Express quoted Cook, as saying after their seven-wicket win at Eden Gardens. "The first thing we had to realise was that we had a problem against spin even if it wasn't as big as everybody made out. We have worked our socks off and we are now starting to get a few results from it," he added. "We cannot say we have silenced the critics because if we have another bad performance it all flags up again, but we are going in the right direction. These two wins here have been obviously very important because we've had a tough 2012. Who would have thought that at the start of the year?" he said.